Sterling silver anniversary gifts, Silver Wedding Gifts, from Nelson and Nelson Antiques located in NYC, New York. Purchase a wonderful sterling silver Tea and Coffee set, Centerpiece, candleabra. Water pitcher or Ewer as a special Anniversary Gift. 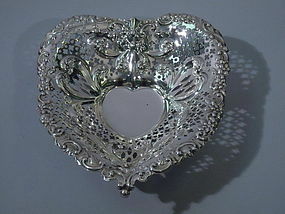 Sterling silver heart bowl. Made by Gorham in 1955. Heart-form bottom with curved and tapering sides. Fancy repousse and pierced ornament. Rests on 3 ball feet. Perfect for Valentine’s Day. Fully hallmarked. Excellent condition.